Sometimes we make things more difficult than they need to be. I know I'm guilty of doing this all the time. I find it's my need for perfection that leads me to know everything about something...before I even dare take one-step forward. I call this "analysis paralysis" and it gets me often, lol! Instead of a complete third degree investigation-I'm opening my eyes and my mind and just getting in there and DOING IT. Whatever it is that's new to me, I'm going forward and learning as a go. Most of this "wait and figure it out" attitude pops up its ugly head when it come is to learning new technology. I hesitate to push buttons and easily get frustrated. However, on the flip side, when it comes to my fashion-I'll take lots of chances and try (just about) anything! My "I'll do it" attitude is full-on go with my style! Stop and take a look at your style choices. Question what you are wearing. Are your outfits daring or creative? Are they colorful? Are they innovative and unique-or do the lean towards the boring side? What changes in attitude can you make in order to improve your style? 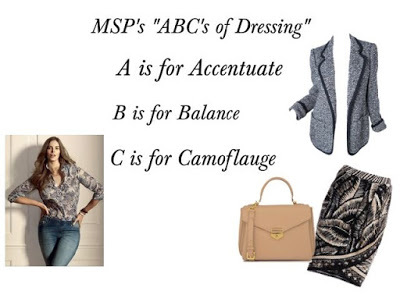 Here's a quick way to move your style forward...Use the ABC's of style every time you dress. *To learn how to apply the A-B-C's of dressing to your daily wardrobe, log in to your body type Personal Profile style membership and read, "Sure Fire Ways to Climb Out of a Style Rut".